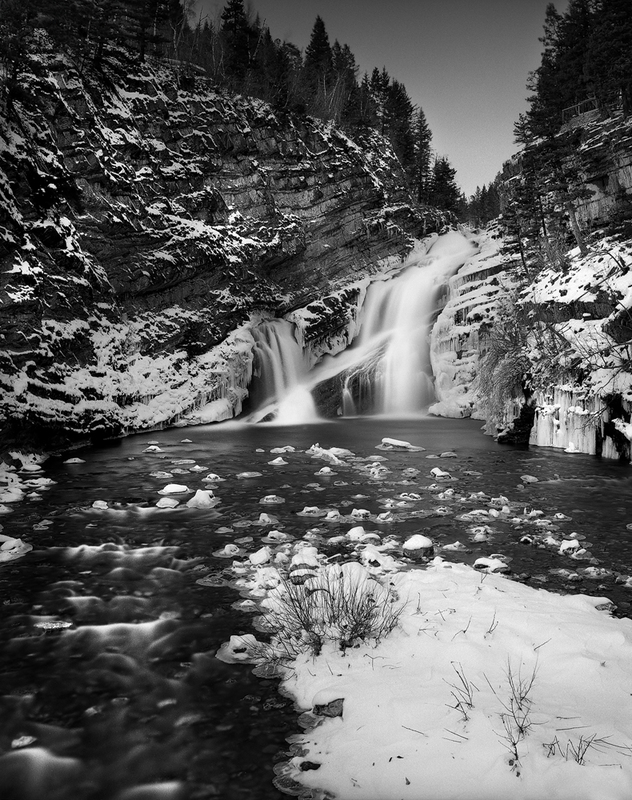 In November 2012, Sarah and I went on a trip to Waterton Lakes Provincial Park in the most southern tip of Alberta. It was an interesting weekend weather wise. The wind was blowing hard and mix in some rain/sleet and you get the picture. I made a few photographs back then. And developed them a few weeks later. Looking at those negatives, I thought I came back empty handed. Nothing on the few rolls of film I had developed really jumped out at me. Sure there was that photograph of Cameron Falls taken at the beginning of the trip that I thought would be OK. After scanning it and 'printing' it, I thought it was too busy and discarded it. Fast forward to the first week of January 2014. I was browsing through my library of film scans when my eye caught that photo again. Immediately I got excited. I opened up the photograph and started wondering why I had not shared it previously. This was a good photograph. Sure it needed a few minimal tweaks but overall, it had good body. That got me wondering. How was it that my opinion on it was so different then last year? Did something change? And if so, what? I think I've matured somewhat in my approach to photography lately. When I took this photograph, I had just let go of digital six months or so prior (August 2012). It was still very tough for me to have a clear visualization of scenes I wanted to photograph and how I wanted it to look on the negative and in the final print. I can now say that that visualization process has matured and I have a better handle on how things look on the negative then before. Also my taste has changed. I've been reading many books over the past months. All of which are by old masters. And I think I am getting influenced by their work a lot. Now with my recent change to 4x5 I suspect that call will become louder and louder. I think that's the reason why I liked this photograph all the sudden.